Check out a WFMJ interview with alumni, Sami Blasko! “I’d like to send out a special thanks to Liz Rubino for all of her hard work and dedication in helping me to prepare for my college auditions. I am happy to say that I have been accepted into the Conservatory of Performing Arts at Point Park University in Pittsburgh and I owe a lot of that to Liz. For many months Liz and I worked together picking out and working on just the right music and preparing specific monologues. Liz also lined me up with an accompanist, a photographer to do my headshots, a dance instructor, and also helped in preparing a professional resume. At my auditions I was told that I was very well prepared, with unique song choices, and I certainly owe that to Liz. I started with Liz Rubino Studios when I was twelve and I must say it has been a lot of fun as well as being a very positive learning experience. I would highly recommend Liz to any new comers looking for a great teacher who is not only kind, caring, and compassionate, but also has great ability and talent and will guide you through all aspects of what voice and the theatre arts have to offer. “Oh my oh my! This is very difficult for me to write because had I not met Liz, I don’t think I would be on this path I follow as of now. I wouldn’t even have met my beloved best friends. I was always an outgoing little girl. I really enjoyed to sing. In fact, my grandma has always said if I’m not talking, I’m singing. I would sing in school talent shows and plays. I also did a bit of community theatre but I was a little figure skater and I focused most of my time on that. When I was 10, my uncle took me to see The Foreigner at the Oakland and on the back of the program, there was an advertisement for voice lessons on the back. I freaked out! I thought that would just be the coolest thing in the world so I begged my mother to contact the woman. That woman was Liz and I took lessons off of her for my school days. Not only did she help me develop and hone my skill, she taught me the importance of performing arts in the lives of children. From Broadway and Beyond, to Aladdin, The Jungle Book, and Frog and Toad, I witnessed Liz teaching and enriching the lives of many people through her love of theatre. I not only had an excellent teacher, I had a perfect role model. Liz even took me to see my first Broadway show. When she moved to NYC, I didn’t really understand what she was going to graduate school for. As I got older, I finally understood what exactly drama therapy was and how vital it can be in the lives of afflicted youth. You see, I always thought I just wanted to be on Broadway but from growing up with Liz I learned that I could use my talents to help others, which I believe is my corner of the sky. The magical world of the performing arts can teach people about so much (my favorite lessons are about love and acceptance) and because of Liz I was able to understand how to introduce others to it. Currently, I am a child life specialist major at Ohio University. My goal is to work as a child life specialist in the hospitals in NYC, possibly be a child wrangler for a Broadway show while being able to audition on the side. I plan on one day getting my masters degree, maybe in drama therapy. Maybe I will join the Peace Corps and bring my love of song and dance over there We will see! -Kayla Boye, Teaching Artist, FOSSE! Reviews For Woman Under The Covers! 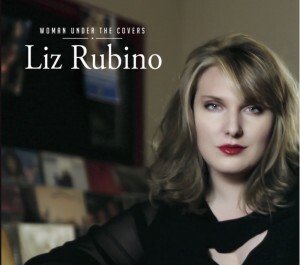 Liz's performance debut of her newest CD, Woman Under the Covers, originally premiered in New York City and is managed by Lampkin Music Productions. Purchase Woman Under The Covers Now! "Liz Rubino is a versatile singer with a beautiful voice who clearly has an open mind towards musical styles. Born and raised in Youngstown, Ohio, she has a strong background in musicals, has become a National AEA stage performer, and is often thought of as a cabaret singer. On her latest recording, she shows that her performances stretch far beyond cabaret, and that she does justice to whatever music she is interpreting......Liz Rubino has an impressive voice, versatility, and the ability to get deep into the emotions of lyrics. Woman Under The Covers features her in top form. "-Scott Yanow, music journalist/historian and author of 11 books including The Jazz Singers. ©2019 Liz Rubino. Site powered by mightylittlewebsites.com.